Last weekend’s baking project was the Lemon-Raspberry Cake from King Arthur Flour’s Whole Grain Baking (Countryman Press, 2006; p. 375). 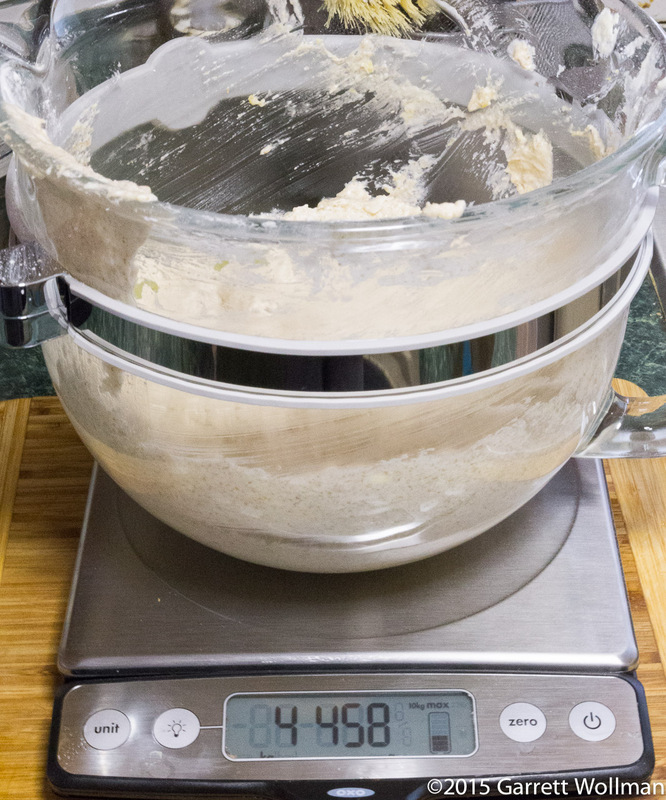 In yesterday’s post, I went into the details of buttercream frosting, which is an important part of this cake — but today I’m going to concentrate mainly on the assembly of the cake. 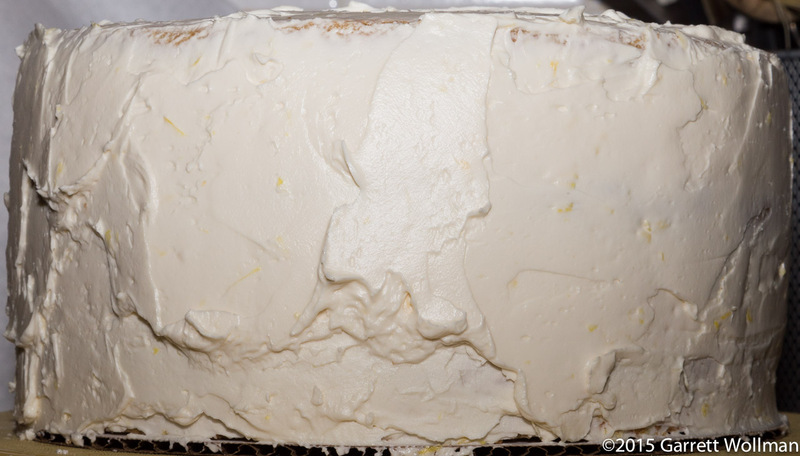 A couple more words about the frosting, first: it’s a lemon buttercream, and unlike many flavored buttercreams, that flavor is actually incorporated directly into the sugar syrup. In fact, lemon is added three times: two tablespoons of juice in the syrup, and then two tablespoons more are added at the end of the whipping process, to give a fresh, uncooked lemon flavor, along with a tablespoon of fresh grated lemon zest. This gives a lovely lemon flavor to the frosting which nicely complements the lemon-flavored cake. We start, of course, with the mise. This cake is a standard butter cake, made by the creaming method, so there’s a half-pound (225 g) of butter and a substantial amount — 12¼ oz (350 g) of sugar. 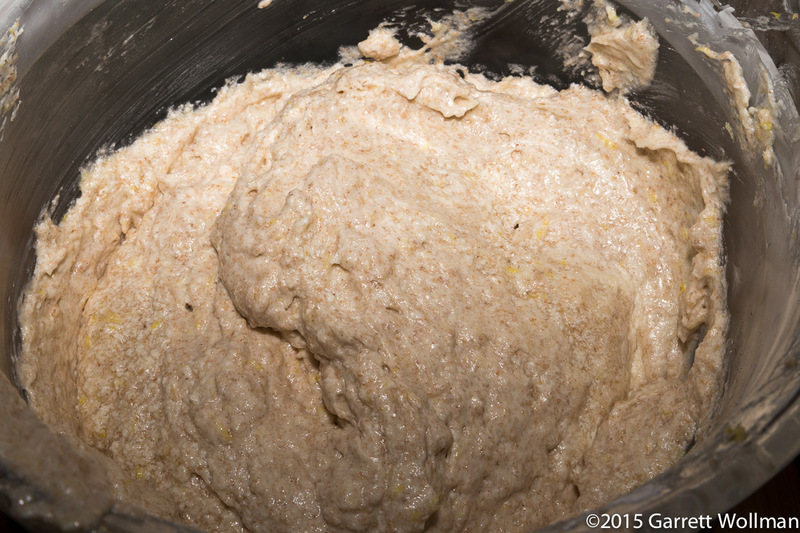 In this case, I gave the sugar a whiz in the food processor to give a finer texture, although I doubt that really made a difference in the end product. Flavoring comes from a quarter-cup of lemon juice and two tablespoons more fresh grated lemon zest — I zested and squeezed four lemons to make sure I’d have enough — plus vanilla extract. The cake is made with egg whites, rather than whole eggs, so I used more of the packaged pasteurized egg whites that I bought for the buttercream. 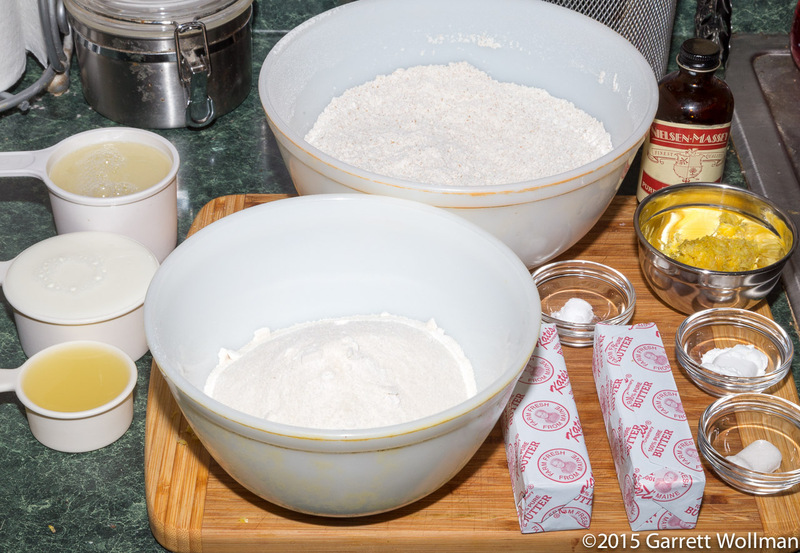 For flour, there’s both whole-wheat pastry flour and regular all-purpose (white) flour. The leavening is baking powder, with some baking soda added to neutralize the lemon juice, and additional liquid comes in the form of milk. The cake batter ends up looking a little curdled after mixing by the usual butter-cake method (which I’ve covered before so I won’t repeat here). Partly this is a result of the wheat bran in the whole-wheat pastry flour, but it’s also a result of the milk being curdled by the lemon juice, as they are mixed together before adding to the batter. The cake layers are baked in a 350°F (175°C) oven for about 22 minutes, then allowed to cool in their pans for about 15 minutes so that they set enough to hold their shape when depanned. Once extracted, they cool completely in about 90 minutes. Only one of the cakes, thankfully, suffered from “doming”, and I didn’t have to cut too much material off to get it sufficiently flat for my purposes. You can see in this view what the internal texture of this cake looks like — it’s a bit coarser than you might expect, both because it’s a butter cake and not a sponge cake and also because of the whole wheat. 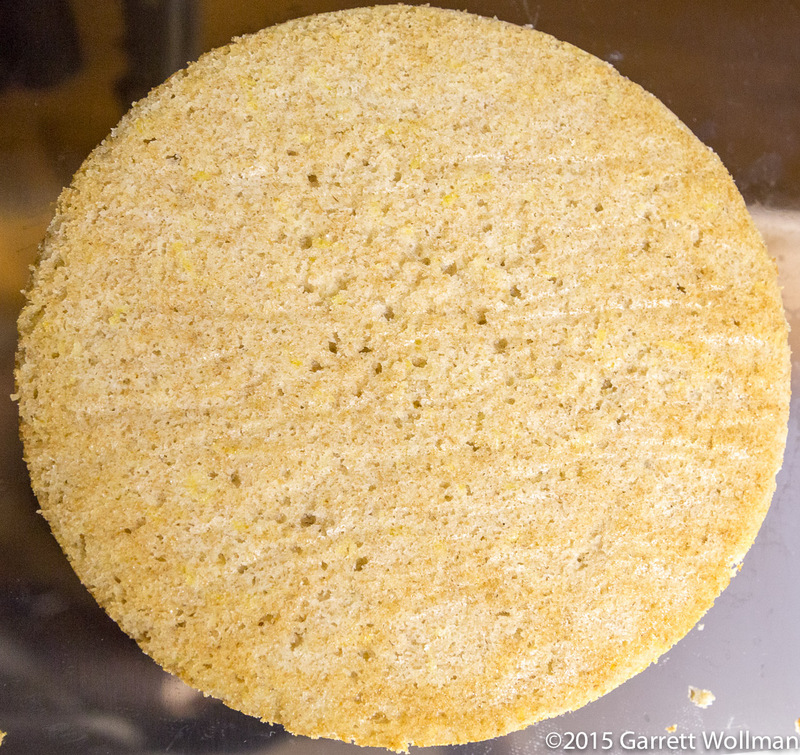 You can see the parchment round is still on the bottom of the cake. I’ve skipped forward a bit (mostly because I forgot to take pictures of the filling). 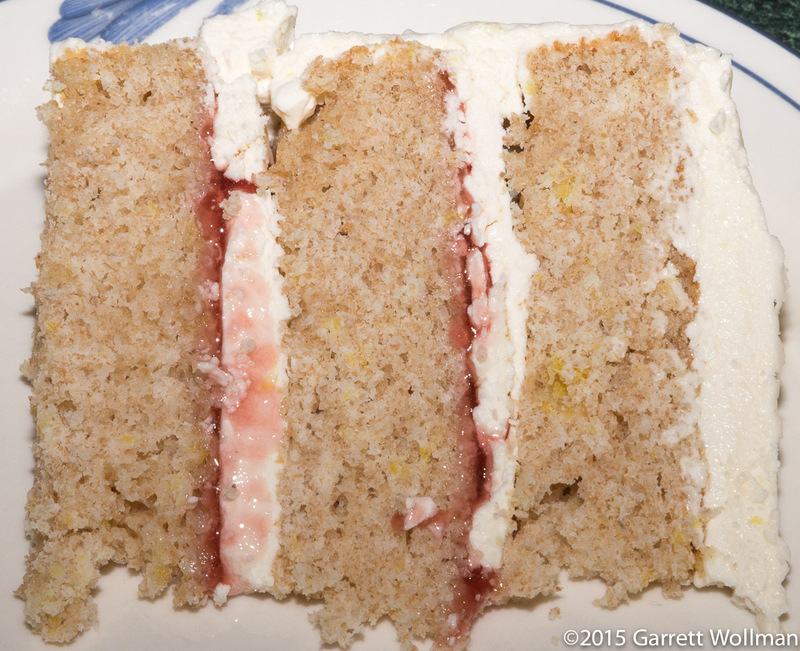 This cake is filled with seedless raspberry jam. 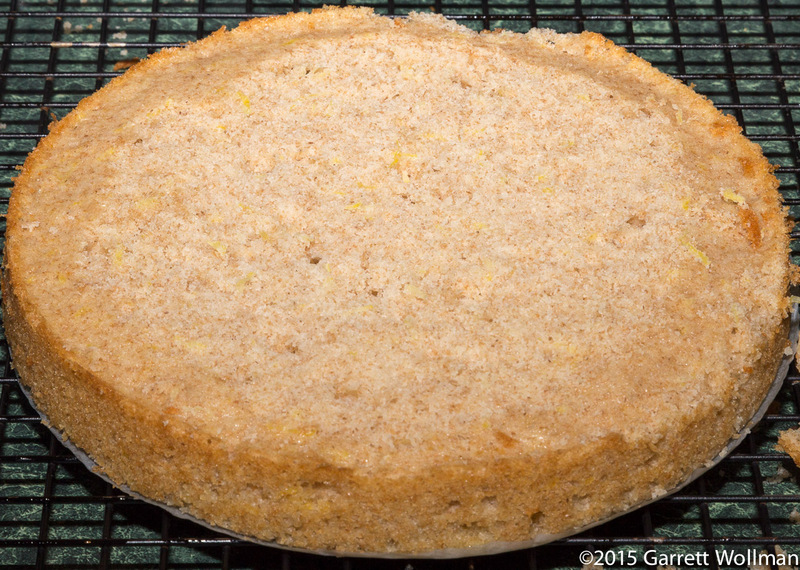 I found that, because of the relatively coarse texture of the crumb, the jam really disappeared into the top quarter-inch or so of the cake, and most tasters were unable to detect it even though I nearly doubled the quantity. After applying the filling, the two bottom layers went back into the freezer to set the jam, and then I crumb-coated all three layers and put them back once again into the freezer to set the buttercream. 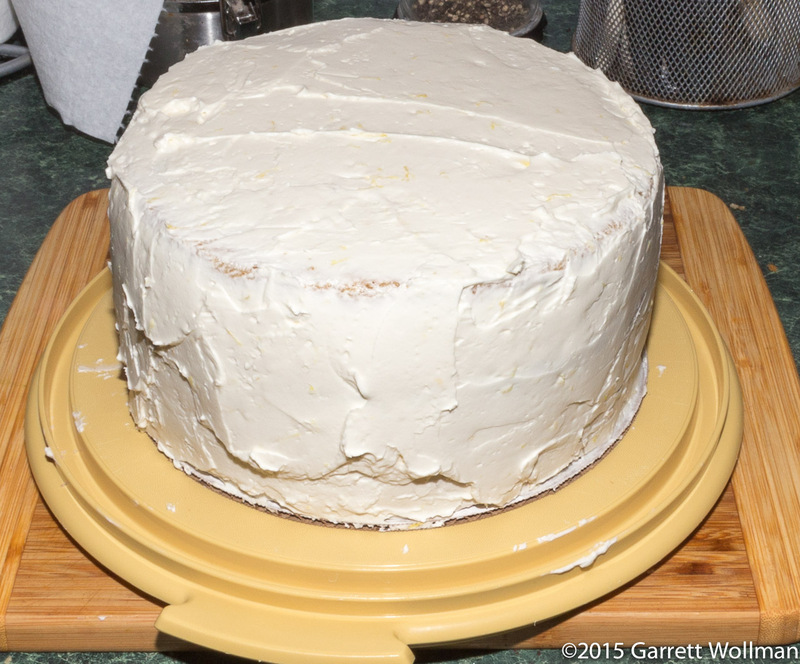 There was just enough buttercream left to fully frost the cake after assembly. I put a dollop or two of additional buttercream into the center to adhere the un-coated, unfilled bottom sides of the layers to the (now hardened) frosted and filled top sides of the layers below. Frosting a cake to commercial bakery standards is one of those jobs requiring patience and excellent fine motor control, neither of which I am endowed with in any abundance. My frosting is pretty much always an uneven mess — one reason I’d never make it as a professional baker or pastry chef. 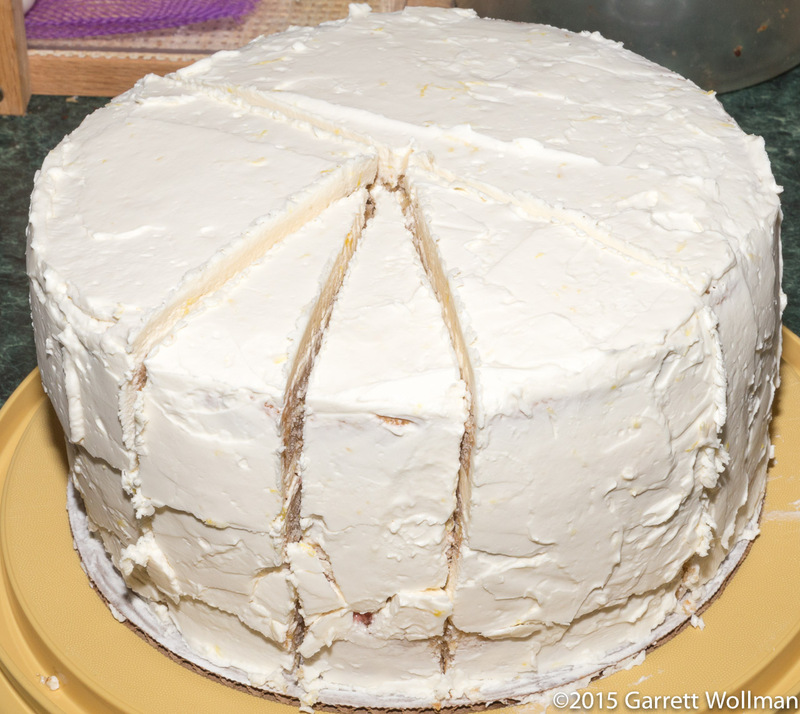 I let the cake sit in the refrigerator overnight for the frosting to solidify before attempting to slice it. This time I tried using the electric slicer, but I found that it required too much pressure and caused the (still solid) frosting to crack. The cake is intended to serve 16. Finally, the big reveal! The cake should be served with fresh raspberries as a garnish, but it’s getting a bit past raspberry season, and I didn’t think to buy any of the expensive imported ones at the supermarket, so no raspberries. This probably contributed to the tasters’ impressions of a lack of raspberry flavor; I wonder if perhaps making a raspberry-flavored buttercream to use as the filling, rather than jam, would have been a better (if more time-consuming) approach. Gallery | This entry was posted in Food and tagged butter cake, buttercream, cake, King Arthur Flour, recipe, whole wheat. Bookmark the permalink.